STL Holiday Historic House Tour – THIS THURSDAY! Get in the spirit of the hol­i­days in high style by vis­it­ing five of St. Louis’ finest his­toric homes and build­ings. For one night only, get the chance to expe­ri­ence the Camp­bell House Museum, Eugene Field House and St. Louis Toy Museum, Chatillon-DeMenil House, Samuel Cup­ples House at St. Louis Uni­ver­sity and Old Cour­t­house, each decked out in their fes­tive fin­ery. Each stop along the way will fea­ture light hol­i­day refresh­ments and enter­tain­ment. Many loca­tions also have gift shops to help you with your hol­i­day shopping! Par­tic­i­pants can tour the loca­tions on continuously-running char­ter buses that will shut­tle them from stop to stop or may opt to take a self-guided tour. To pur­chase tour tick­ets, call the Camp­bell House Museum at (314) 421‑0325 or click here to pur­chase tick­ets. Time is running out! We hope to see you there! Don’t be a scrooge! Join us for the St. Louis Holiday Historic House Tour! Click here to make a gift in support of the Campbell House Museum. After the hustle and bustle of Black Friday and Cyber Monday, today is Giving Tuesday – a nationwide movement to increase awareness and support for charitable organizations during the holiday season. The Campbell House Museum might not be the first place to come to mind when you think “Charity”. After all, so many of our wonderful museums in the St. Louis area are supported by tax dollars and through government funding and thus are guaranteed a constant stream of revenue. CHM, however, is entirely privately funded and it’s only through the generosity of folks like you that we’ve been able to serve the St. Louis community for the past 71 years. A gift in support of the nonprofit Campbell House Foundation makes it possible for us to continue to serve hundreds of children in your schools, collaborate with other small area museums and keep up the Campbell House as one of the best restored 19th century buildings in America. 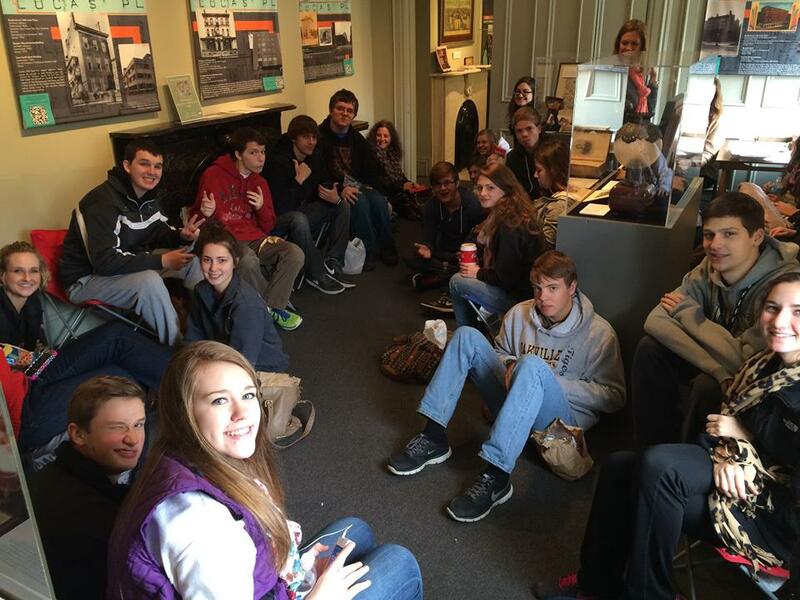 Students at the Campbell House last month. Education programs are made possible only through donor support. We’d love to have your support. A gift to Campbell House on this Giving Tuesday shows a commitment to St. Louis historic preservation and education and makes a strong statement that CHM is worth giving some of your hard-earned dollars. Please click here to make a donation quickly and securely online, call the Museum at (314) 421-0325 to donate over the phone or mail to 1508 Locust Street, St. Louis, MO 63103. So, thank you from Robert and Virginia and all of us at CHM. Please come and see us soon! The Campbell House Museum is owned and operated by the Campbell House Foundation, Inc., a 501 (c)(3) non-profit organization.